Inquiring minds may want to know what educational forms will replace schooling. In this post I'm going to describe what the authors of DC predict. In the next post, I'll argue that those changes might be necessary but are decidedly not sufficient. 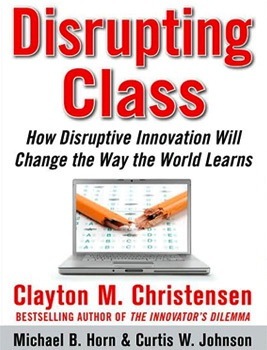 Disrupting Class does not contend that schools will cease to exist or that teachers will be replaced entirely by software. Instead, it projects a shift from the existing business model, which the authors identify as "value-chain" industrial processing, to a "facilitated user network" model. (fn 9) Put simply, rather than educators' adding value to students (by instructing them), educators and learners alike will use learning tools to access or create instructional modules. A common misreading of the book, based on the commentaries and complaints that have issued in response to it, is that online learning is the disruptive innovation to schooling. The authors contribute to this confusion by conflating the concepts of online learning and computer-aided instruction. Yet they describe the disruptive innovation as "student-centric learning" facilitated by "computer-based learning products." (fn 10) Although online learning is the most visible (and measurable) manifestation of the disruption (fn 11), it's just a single aspect of the first disruptive stage. 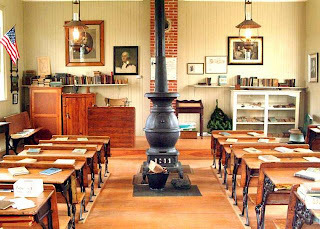 The disruptive innovation is better understood as a shift from teacher-based instruction to, first, computer-based instruction, then second, to student-oriented computer-delivered instruction. In education, we increasingly refer to this shift as "individualized learning." Student-oriented computer-delivered instruction... Individualized learning. Potayto... Potahto. Instead of instruction delivered by teachers delivering, we'll have modularized, self-paced computer-delivered instruction. Teachers will presumably help students to determine their learning needs, and will supervise -- perhaps even assist in -- the learning process. 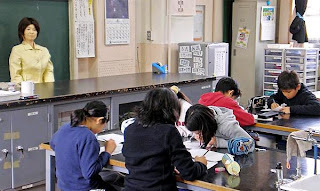 Teachers may even provide useful enrichment to the learning, through personal connection with students, applications of the learning, and coaching in various skills. "Japanese School 'Hires' World's First Robot Teacher,"
posted by Geek on 9/12/09 to RealityPod. These transformations will present some huge opportunities for learning. But they will also create some tremendous challenges -- not to mention the temptation to turn teachers into network monitors. In any case, the technological aspects of this disruptive innovation are already occurring -- in fact, already tipping toward inevitability. So, we educators need to start preparing now for how we'll shape the new learning environments and processes that emerge. Which is what I'll discuss in the next post. fn 8 - Details on this projection are provided in my preceding blog post, "The Tipping Point to Personal Learning - Part 1." fn 9 - DC, pp. 126-127: "Manufacturing, retailing, and food service companies are examples of.. value-chain businesses. These companies bring inputs of materials into one end of their premises, transform them by adding value, and deliver higher-value products to their customers at the other end. ...Most teaching currently operates like a value-chain business, too. Students are herded into a classroom at the beginning of the school year, value is added to them, and they're promoted to the next grade at year's end. "In... facilitated user networks, customers exchange with each other." Examples are telecommunications, insurance, and banking. "Participation in the network typically isn't the primary profit engine for participants. Rather, the network is a supporting infrastructure that helps the buyers and sellers make money elsewhere. The company that makes money in a user network is the one that facilitates the network." fn 10 - DC, pp. 122-124. Throughout these pages, the authors use "online," and "computer-based" interchangeably. For instance, they say, on p. 123, "[The] second stage of disruption in public education...will cause the world to 'flip' and make student-centric online technology a reality." Their terminology is confusing, especially for educators used to a pretty specific meaning for the phrase "online learning." fn 11 - Disrupting Class was published in 2008. Since then, their projection has been borne out by actual events in the education marketplace. Online and blended learning, which grew from 45,000 enrollments in fall 2000 to one million in fall 2007 (DC, p. 98), grew again to 3 million in fall 2009 ("The rise of K-12 blended learning (executive summary)," by Michael Horn and Heather Staker, from Innosight Institute; Inosightinstitute.org/media-room/publications/education-publications/the-rise-of-k-12-blended-learning/ -- accessed 3/16/12/). In addition, virtual school enrollment is growing by more than 10% per year ("Marketplace Adjustments," by Ian Quillen, in Education Week: Technology Counts, 3/15/12, p. 28). fn 13 - "Khan Academy Talks Analytics, OER, and iPads," by Stephen Noonoo, in t/h/e Journal, 4/5/12, http://thejournal.com/Articles/2012/04/05/Khan-Academy-Talks-Analytics-OER-and-iPads.aspx?Page=1 - accessed 8/28/12). fn 14 - "Students want personalized learning, mobile technology," by Laura Devaney, in eSchool News, 4/26/12, www.eschoolnews.com/2012/04/26/students-want-personalized-learning-mobile-technology/? - accessed 8/28/12). The article summarizes and quotes the survey report entitled "Mapping a Personalized Learning Journey: K-12 Students and Parent Connect the Dots with Digital Learning" (/www.tomorrow.org/speakup/pdfs/SU11_PersonalizedLearning_Students.pdf). fn 15 - DC, p. 134: "The tools of the software platform will make it so simple to develop online learning products that students will be able to build products that help them teach other students. Parents will be able to assemble tools to tutor their children. And teachers will be able to create tools to help the different types of learners in their classrooms. These instructional tools will look more like tutorial products than courseware." fn 16 - DC, p. 136. The vision of this technological utopia is laid out in pp. 134-141. Ultimately, the disrupted organization or industry is destroyed. The only organizations that "survive" are the ones that essentially re-invent themselves; in other words, the organization's name is about the only thing that remains. (fn 6) So, the authors project, despite schooling's continual improvement throughout the 20th century and into the 21st (fn 7), "software-delivered instruction" will destroy public K-12 education -- at least destroy the institution that we identify as public education. Exactly what the new forms of education will look like is unclear. But if - as seems likely - the DI model applies, within a decade we'll be doing school in completely new ways. What new ways? No schools? No school districts? No teachers? Well, the authors of DC have some thoughts on this. And so do I. Next post. fn 1 - DC, pp. 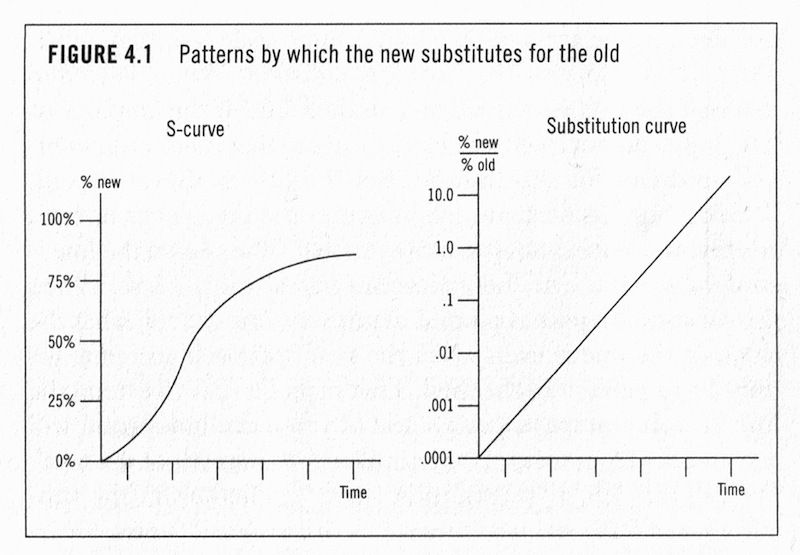 98 and 102.
fn 2 - DC, p. 47: "A disruptive innovation is not a breakthrough improvement. Instead of sustaining the traditional improvement trajectory in the established plane of competition, it disrupts that trajectory by bringing to the market a product or service that actually is not as good as what companies historically had been selling. ...[B]y making the product affordable and simple to use, the disruptive innovation benfits people who had been unable to consume the...product -- people we call 'nonconsumers'." Transistors, for example, weren't powerful enough to run the large radios (and televisions) that served as the household entertainment centers from 1920 to 1970. But transistors opened a wholly new market -- portable entertainment that one could take to the park or commuting on the bus. Other examples: Personal computers (vs. mainframes), the iPod (vs. CD players), or "Ask Chuck" stock purchasing (vs. brokerages). fn 3 - DC, pp. 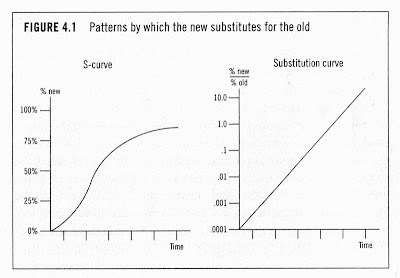 91-92.
fn 4 - The S-curve of substitution shown below is from p. 97 of DC. fn 5 - The quoted text is from DC, p. 96. See pp. 76-81 of DC for three case studies of disrupted companies -- RCA (electronics), Merrill Lynch (investment management), and Nypro (industrial processing). Numerous other examples are sprinkled through the book, for example on pp. 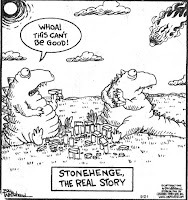 58 (Canon disrupting Xerox; Japanese car companies disrupting American automakers) and 60 (Compaq and Dell disrupting DEC; Wal-Mart and Target disrupting department stores; Apple disrupting recording distribution). fn 6 - DC, p. 61: "In our studies of disruptive innovation in the private sector, we are not aware of a single instance in what a for-profit company was able to implement successfully the disruptive innovation within its core business.... The few that survived disruption did so by creating, under the corporate umbrella, a new business unit, with a new business model attuned to the disruptive value proposition." fn 7 - DC, p. 51. The authors of DC are not among the legion of critics who blame schools for our societal decline. 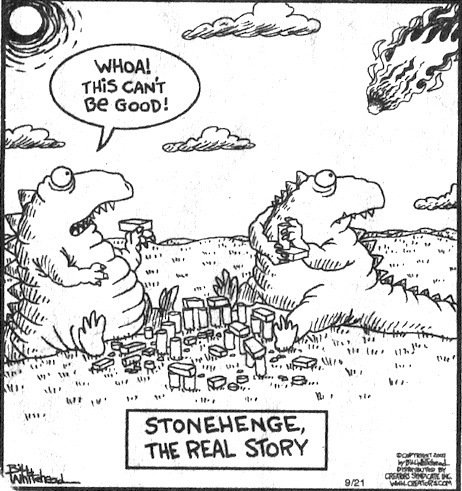 Indeed, they make a powerful argument (pp. 51-64) that schooling has been hugely successful. They contend that schools have done "remarkably well" despite numerous substantial shifts in the demands placed on them -- better, in fact, than private sector companies have done when faced with comparable disruptions.